This simply designed yet beautiful to look at six drawer dresser will deliver heirloom quality and style to your bedroom. 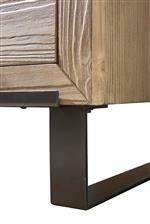 The piece is constructed from solid spruce in a vibrant natural wood stain, that pairs beautifully with the steel bar handle hardware and base. As storage goes, you receive six spacious drawers with two cedar-lined bottom drawers to protect your bulkier, out-of-season clothing. Furthermore, the top drawers feature felt-lining and a jewelry tray to protect your fragile accessories. 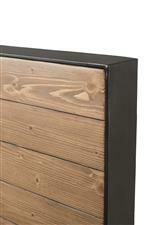 The Edgefield Contemporary-Rustic 6 Drawer Dresser with Jewelry Tray by Cresent Fine Furniture at AHFA in the area. Product availability may vary. Contact us for the most current availability on this product.